When I first picked Silver Spoon (also known as Gin no Saji) I wasn’t really sure what to expect. All I knew was that it was about a city slicker out in rural areas, in over his head, and that was it. This first episode has proven particularly enjoyable and expands that basic premise to a refreshing twist on the usual high school setting. Yugo Hachiken is beginning his studies at Oezo Agricultural High School, a specialty school for those entering the agricultural sciences. Complete with fully equipped livestock and produce farms, its students enjoy regular academic studies alongside practicums centered on different aspects of the agricultural industry. Hachkien’s first day consists of getting lost while chasing a calf, being gnawed on by a horse, and learning just where an egg comes from. It’s all mundane activity but his reaction to learning that an egg is birthed through the cloaca of a chicken and the resulting gross-vs-hunger dilemma are very entertaining and applicable to today’s society. 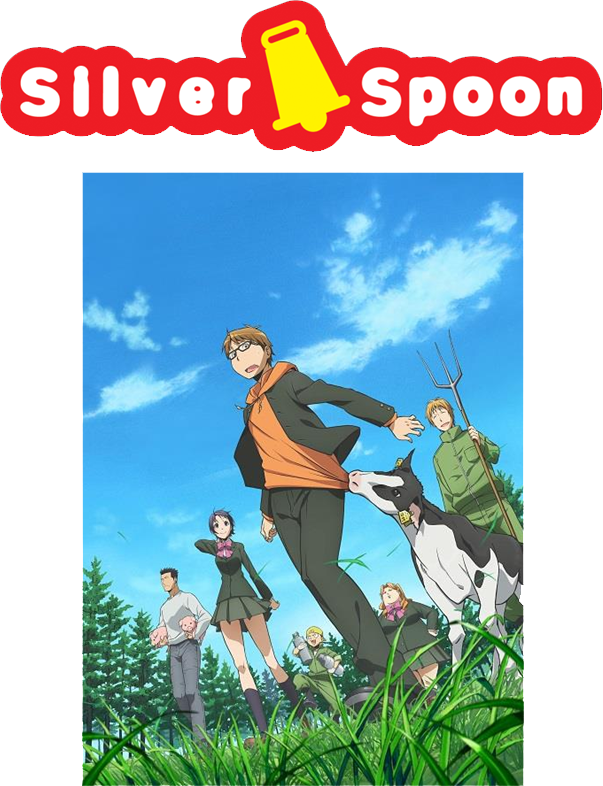 Silver Spoon also shows farming practices and makes comment, however casual, as to the moral nature of those practices and I greatly appreciate that. I find myself grinning and chuckling at the don’t-judge-a-book-by-its-cover approach to the story telling because it’s a delightful change from the basic high school stereotypes one so often encounters. Hachiken thinks he’ll do well in subjects like math and yet, when it comes to trade-specific conversation, his classmates carry on very technical discussions about bioengineering that leave him in the proverbial dust. It’s an amusing turn, for sure, and highly enjoyable. 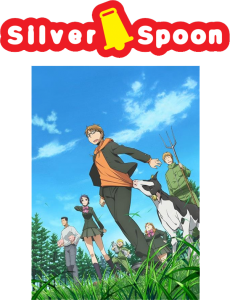 I also feel like Silver Spoon will be an excellent bridge between modern consumer and modern producer, offering insight and information framed in an entertaining story. The animation is smooth and enjoyable and I didn’t really notice the music, save for the opening and closing songs – which were also very good. The negatives I would say would be that it felt kind of disjointed with the back and forth to multiple locations throughout the day but that’s about it. The writing is witty and the city kid landing himself in a country bumpkin world is like a breath of fresh air. All in all, I think this might be a winner this season and look forward to more.